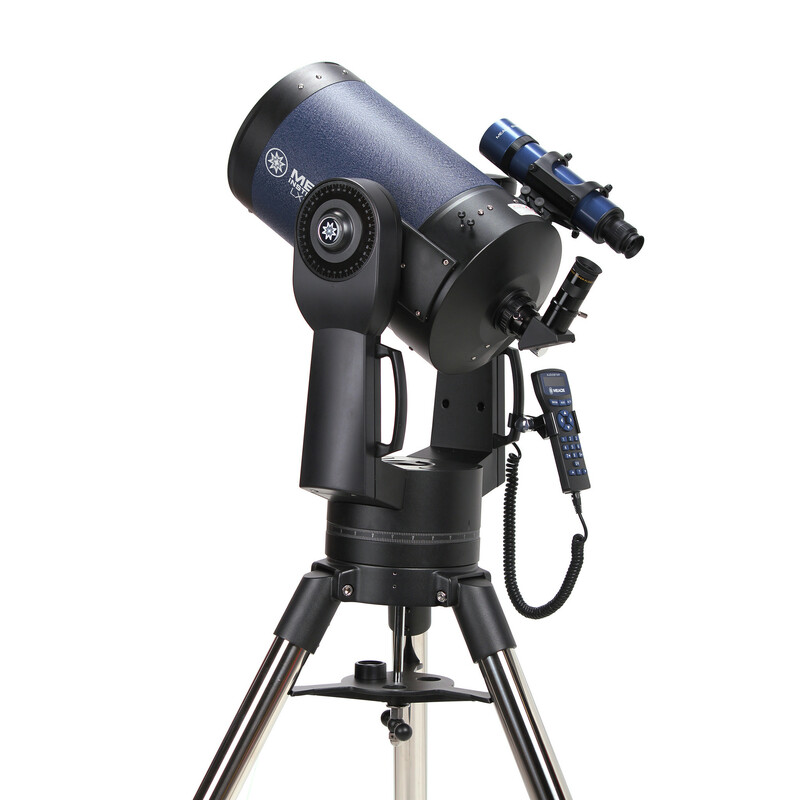 The Meade 10" LX90-ACF Telescope yields similar optical brilliance to the LX200 flagships, but in a package providing better value for those primarily observing rather than imaging. The quality, workmanship, design, and features will satisfy novices and experienced professionals alike. This is the "ACF" version of the 10" LX90, which stands for "Advanced Coma-Free". Meade has employed advancements beyond the traditional Schmidt-Cassegrain catadioptrics for the LX90-ACF, gaining significant resolution increases as you move away from the center of the field towards the edge. The 10" LX90-ACF with UHTC multicoatings is a serious deep space aperture instrument, but is still of a size that can be managed by one able-bodied person. It provides a notable difference in brightness and resolving power versus the more common 8" catadioptric scopes. To truly appreciate the aperture, you'll need dark skies above you, whether you're blessed not to live amongst artificial light pollution or able to commute to a similar location for observing purposes. 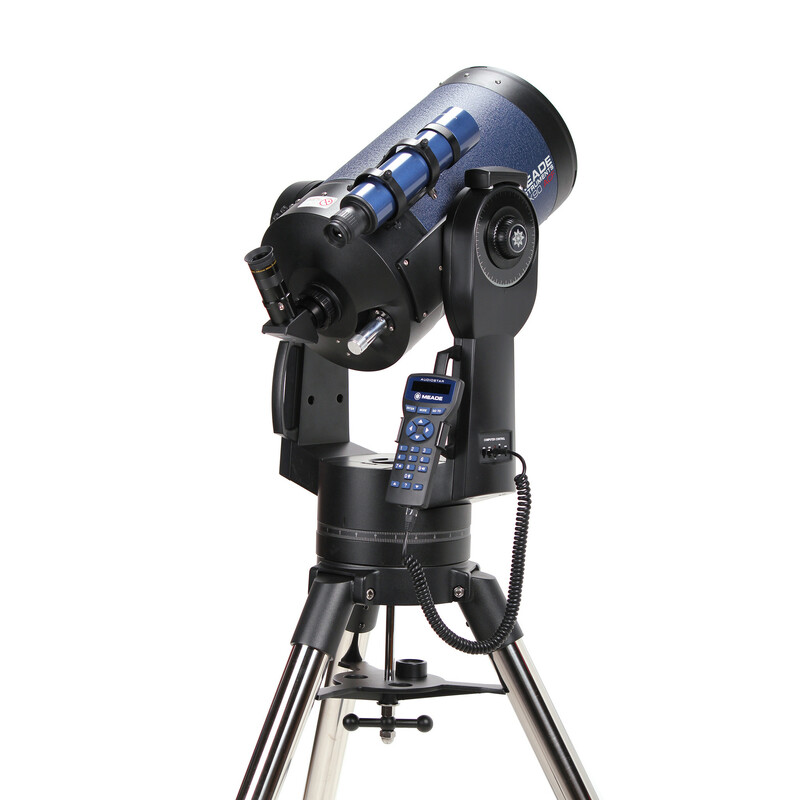 Meade combines high quality optics, stable double fork mounting, computerized control, and streamlined appearance in a single unit. The list of technology within is long and exhaustive: a rigid mount with beefy tripod, an oversized primary mirror, truly diffraction-limited optics, and the very finest of simple and accurate GPS-enabled alignment. The 10" LX90-ACF's standard-equipment AutoStar computer controller connects to the telescope's control panel and permits viewing and tracking of 30,223 database objects. That's 50 objects in the solar system, 8 major planets from Mercury to Pluto, the Moon, 26 asteroids & 15 comets. An apparent endless supply of galaxies, diffuse nebulae, planetary nebulae and star clusters are present, including the complete Messier, Caldwell, IC, and NGC catalogs. You'll also enjoy looking at 50 satellites, including the International Space Station and the Hubble telescope. You can do some light-duty lunar/planetary imaging (of up to ~5 minute exposures) with the LX90 through the eyepiece using a digiscoping adapter or with an SLR via the SLR adapter and your camera system's specific T-mount. 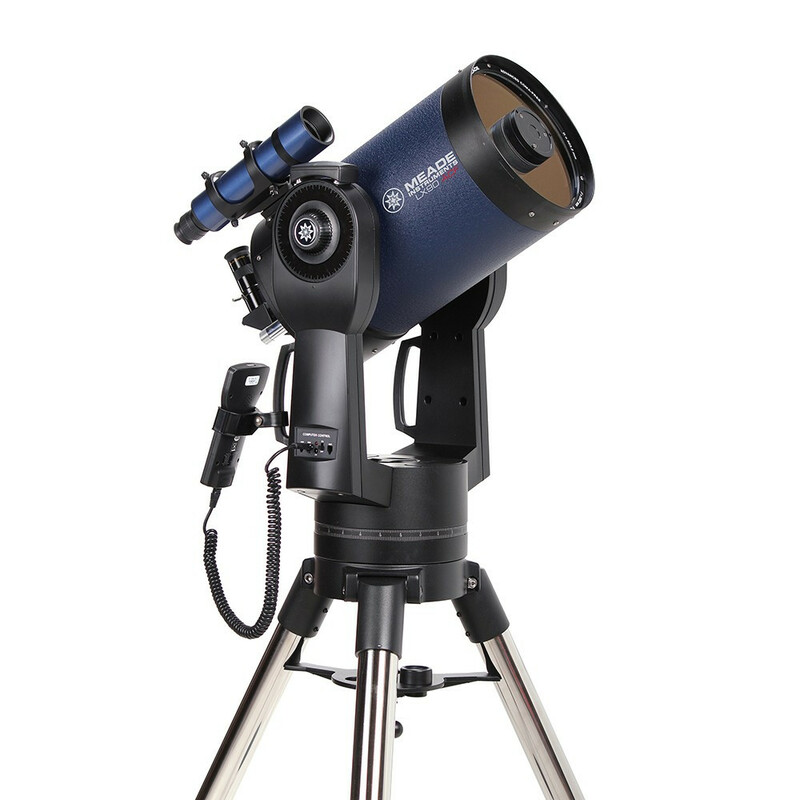 For deep space images of exposures much longer than a few minutes, you'll need a Meade Deep Sky Imager; the 10" LX90 cannot use a wedge and thus cannot make streak-free long exposures with an SLR camera (the Deep Sky Imager's software corrects for field rotation). Power for the LX90-ACF is supplied by 8 "C" batteries, but via optional accessories you can also adapt to an AC wall unit or a vehicle's cigarette lighter (which can operate in the field off of a Celestron Power Tank). Everything needed to begin observing immediately is included except for the power supply. 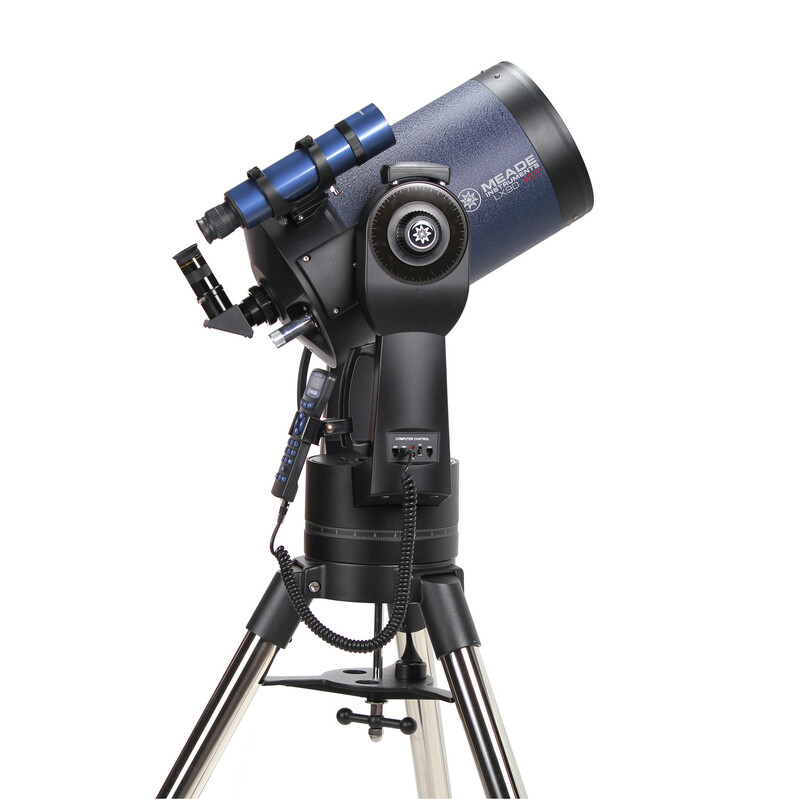 The LX90 features a Sony GPS receiver sensor, which automatically inputs ultra-exact time, date & location values to help quickly align the telescope with remarkable (~1 arc minute) precision. After you level the scope and point it roughly north, AutoAlign™ picks two alignment stars for you and places them right in your viewfinder-just center them to fine tune alignment and the universe is at your fingertips! The hand matched diffraction-limited optical system is individually inspected at Meade's Irvine, California facilities after production. The primary mirror's diameter is larger than the listed aperture, yielding a wider & fully-illuminated viewing field. Make ~5-minute lunar/planetary exposures in the LX90's standard mode (with a digiscoping adapter or SLR camera adapter), or longer exposure deep space images by adding a Meade Deep Sky Imager. Box Dimensions (LxWxH) 39.0 x 38.0 x 38.0"